We design and launch a lot of websites for clients. Each one is filled with enhanced user functionality, a renewed sense of purpose and mission and lots of eye candy. So when it came time to design and launch our own new home on the internet, we had to think big. That combination of standout creativity and a clear path forward starts to shine immediately, right from the home page, where Durante says the AW team had to go back to school, to use math skills that would make the angled visuals window—a nod to the new AW brand—open and close properly. But a flashy home page was just the start: Durante says the new site is based on a deep dive into the analytics of the old Austin Williams website. By determining which pages were most popular, designers built a site map that focused on those pages, then created a UX that would provide the best user journey to that information. 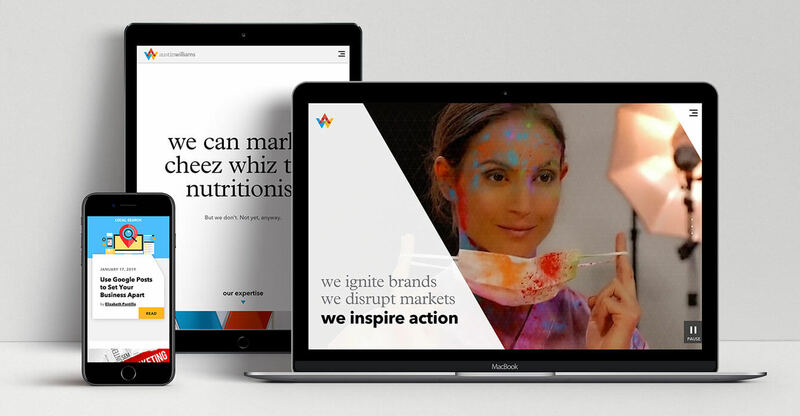 When it came to the creative design of the website, Durante says Jody Bonaventura-Fisher, senior art director, dove in with both feet, creating stunning ways to present everything from case studies to agency expertise and services. From there, Bonaventura-Fisher says, she went down a “rabbit hole” of design options, tinkering (almost endlessly) with different suggestions for sets of pages. How did she settle on the right ones? “Deadlines help,” she admits. Bonaventura-Fisher was also the creative force behind identifying “flixels” to present our team members on the People page. Each image in the gallery is animated, to “show a glimpse of each of us: our characteristics, quirks, interests, passions and humor,” says Durante. And now that it’s live?